We are counted among the major white Phospo Gypsum manufacturers and suppliers based in india. 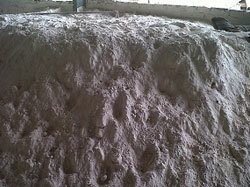 Phospo Gypsum is widely used in plaster of paris, soil conditioner, fertilizer, blackboard chalk and other products. Phospo Gypsum is the phosphate fertilizer industry solid waste,and phosphoric acid is the found of phosphate fertilizer.